The Village of Panorama is located 20 minutes southwest of the Town of Invermere in the East Kootenay region of British Columbia. From Calgary, it's a 3.5 hour drive and definitely doable for a normal 2-day weekend. Extend your trip to a 3-day weekend though and you'll find the trip a bit more relaxing. What really sets the Panorama Mountain Resort apart from other ski resorts that we've visited is its isolation from other nearby towns. With Invermere 20 minutes away, Panorama has to be its own village, complete with accommodations, restaurants, après ski activities and nightlife. While you "could" drive to Panorama for a day of skiing, and many do, the true "Panorama experience" comes from staying on the hill, soaking in the ski culture and vibe, and relaxing in the slopeside Panorama Springs hot pools at the end of the day. We found the above quote to be true with our stay. We drove out to Panorama from Calgary Friday night, stopped in at Central Check-in (which is a convenient way of doing things rather than having individual check-in desks inside each property,) and then drove over to our condo, The Panorama Springs Lodge. There are various lodging options in the village from ski-in/ski-out condos to larger townhomes for families needing more space than the average condo. There is also an economic choice in the Pine Inn, located right at the base of the ski hill and with restaurants conveniently located on the ground floor. We loved our condo in the Panorama Springs Lodge and I'm pretty certain I could have moved in permanently. Our suite had a comfortable living area with electric fireplace, a small kitchen and dining room, a large master bedroom with ensuite bathroom (with king sized bed,) and then a smaller bedroom with two twin beds that could be pushed together into one larger bed. The best part of staying in the Panorama Springs Lodge was the easy access we got to the Panorama Springs Pools. Located inside our building, we didn't have to put on our winter coats to walk to another building. It didn't take us long to figure out a routine that worked well for us at Panorama. If there would have been fresh snow overnight, things would have changed I'm sure, but we were looking at a "corduroy" weekend with no fresh powder. Awesome to be skiing with this kid! We got in line for the lifts first thing each morning at 9am. Then we headed up the Mile 1 Express Quad, and straight up the Champagne Express Quad. This put us at the top of "Rollercoaster," a groomed blue cruiser and wicked fast! After an hour or so, this run would start to get icy, so it was best enjoyed (and safest) on fresh corduroy. By the time we skied down Rollercoaster, and rode the Champagne Express back up, the Summit Quad would be opening at 9:30am. We skied straight over to it and enjoyed fresh corduroy down the steep but groomed "View of 1000 Peaks," a black run with some steep pitches, and also best with fresh grooming. 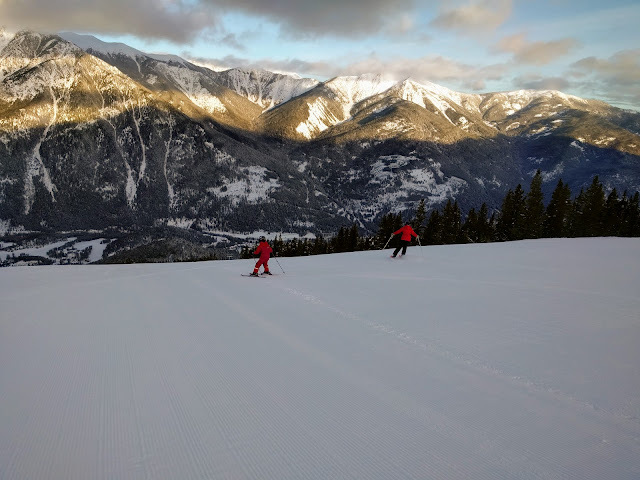 Fresh corduroy and great views! View of 1000 Peaks either took us over to Founde'rs Ridge (where you'll have the entire area to yourself at 9:30am,) or back to the bottom of Champagne Express. If heading up Champagne again, we'd choose to traverse over towards the Summit Chair, skiing down "Schober's Dream," another black/blue run that's groomed with fresh corduroy first thing in the day. It didn't take long each day before the fresh corduroy would be skied out, and groomed runs would start to get icy. This was the sign that it was time to move on to the Sun Bowl. The Sun Bowl runs were less groomed and better with the soft afternoon snow. We also liked that we could all take our own line down through the large bowl, choosing mogul runs, easy traverses, or fun gladed runs. 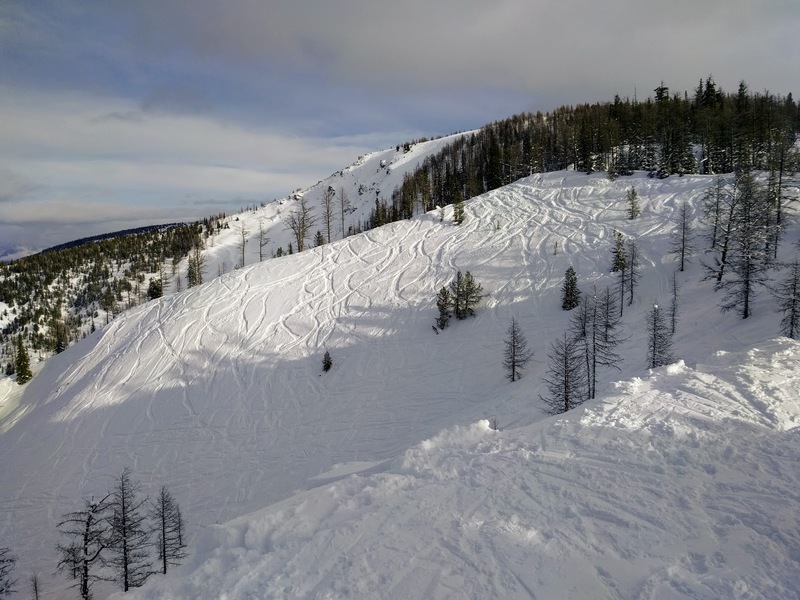 Most of the terrain in the Sun Bowl is intermediate, making it a dream for families not wanting anything too "intense." The only challenge with the Sun Bowl was getting to the area! The only easy way we found to get into the bowl was by skiing down from the bottom of the Summit Quad on Schober's Dream (quite steep at the top and icy by afternoon.) And then unfortunately, there was no chair to take you back up into the Sun Bowl so you were pretty much looking at riding up to the top of the mountain again, and skiing all the way back down. For these reasons, we only did one run down through the Sun Bowl each day. Another afternoon favourite was "Fritz's" on the lower mountain, a groomed black run that never seemed to get overly icy. It was also the only way we found to access the "Secret Forest" with awesome tree house for the kids. (The other easier way to the tree house was down "Old Timer" but it was closed for training and racing. Finally, we spent a lot of time skiing the short runs off the Sunbird Chair at the bottom of the mountain. 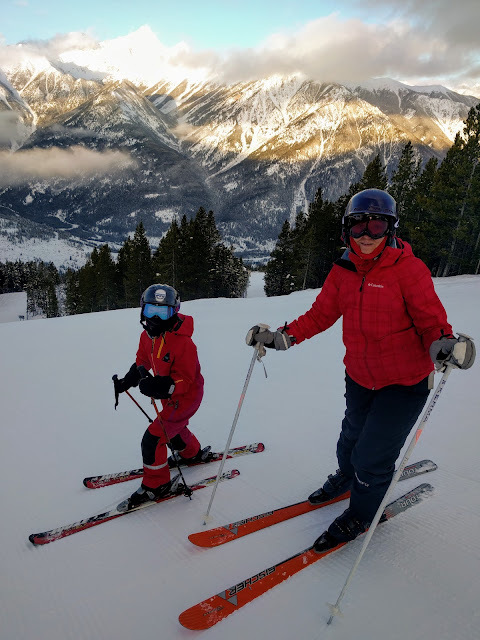 My son loved skiing down under the chair on the main "Sunbird" run, a black mogul run, and I discovered a nice easy groomer in "Out Rider," a mellow green run that takes you down beside the landing pad for the Panorama paragliding operation. There is a large terrain park off the Mile 1 Express Quad but my 9-year old won't be ready for that one for quite some time yet! Fortunately, we discovered a more "Secret terrain park" off the small Toby Double Chair near the bottom of the hill. I know that I've been talking mostly about intermediate terrain with a few groomed black runs but Panorama is also a great hill for young kids or beginner skiers. 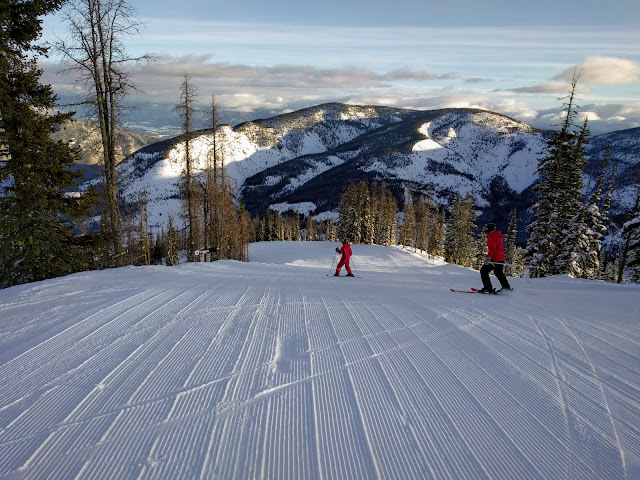 There are two magic carpets for progression of skills when first introducing the kids to the basic ski techniques. From the Silver Platter, move on to the Discovery Quad with its short green runs and the awesome "Discovery Zone," with a special tree course for the kids - that is a guaranteed crowd pleaser for all children, no matter how experienced at skiing. 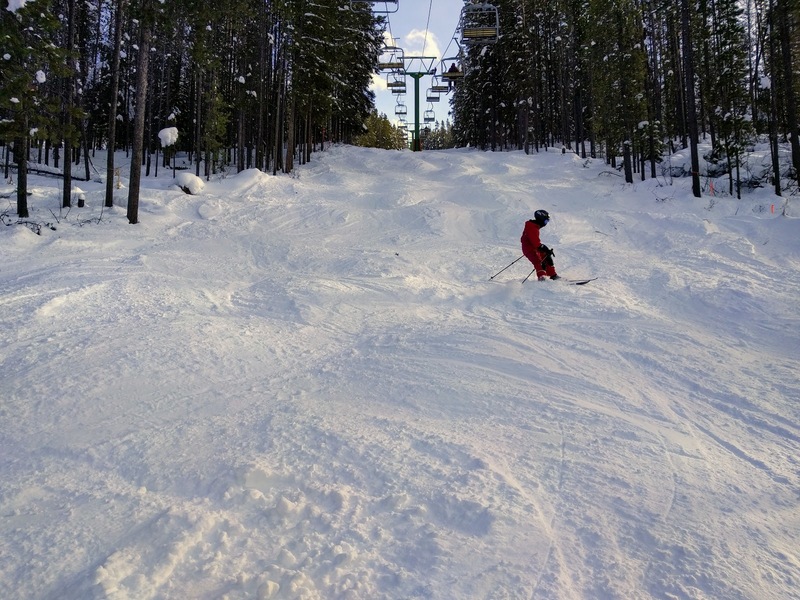 After getting comfortable on the beginner terrain off the Mile 1 Express Quad, skiers can try "Out Rider" off of the Sunbird Chair (but know, it is a bit steeper than your average green run, and more of an intro-blue run.) Higher up the mountain, I can't recommend anything for true beginners. And also to note, Panorama offers a great Wee Wascals child care program for families of little ones who might not want to ski the whole day. They accept babies as well as young as 18 months! 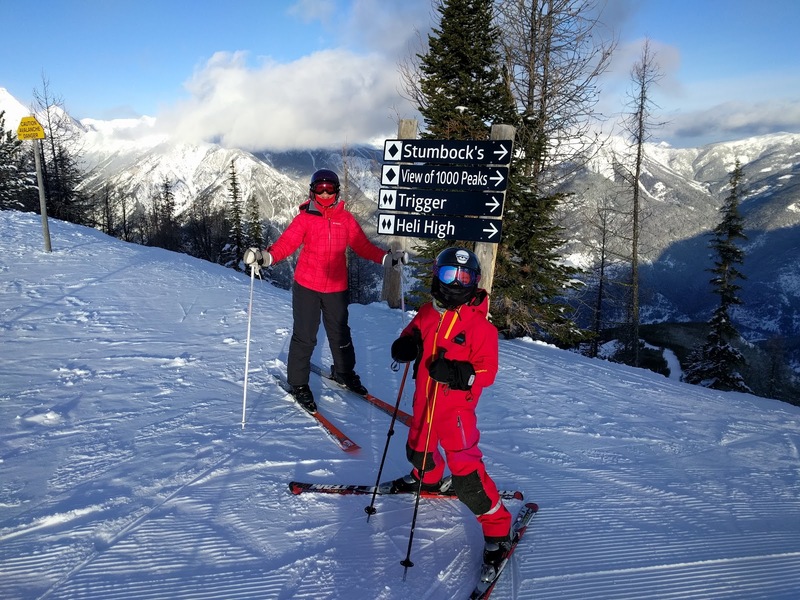 - which is a great option for families wanting to spend time skiing with older kids, and not sure what to do with the youngest family member. Panorama has a European Ski Village feeling to it with cute little huts spread out around the hill serving fondue, raclette, and other popular menu items for the ultimate lunch or après ski experience. At the top of the mountain, you'll find the Summit Hut, a cozy place to warm up with great views. You'll find gourmet smokies, homemade treats, and hot drinks. And for something extra special, book an evening heli-fondue with RK HELISKI. Fly up to the hut after the lifts close for the evening and enjoy both cheese and chocolate fondues. You can also participate in the fondue experience at the summit hut without the helicopter ride by loading the last chair of the day to the summit, and then enjoying a guided ski back down to the base. Visit the Panorama website for more information on Après-fondue experiences at the Summit Hut. Further down the mountain off the top of the Champagne Express, you'll find the Elkhorn Cabin with the best homemade apple cider on the hill! Guests can also enjoy fresh homemade soups and Swiss Raclette (a cheese and meat grill popular with European skiers) in this small cabin. Raclette is served all day long in the cabin but you can also make a reservation for after the hill has closed and enjoy a guided ski down after your après ski party. Visit the Panorama website for more information on the après ski raclette experience at the Elkhorn Cabin. This is where you'll find grilled burgers (bison, salmon and veggie,) local Kicking Horse Coffee and a variety of baked goods and treats. There are several options for dining in the village (for all meals,) so I'll just tell you about the two restaurants we enjoyed. - and you can read about all of the village options here. Saturday night we had dinner at the T-Bar & Grill, a family-friendly pub style restaurant. The food was amazing for a casual grill restaurant and I'd eat here again on future trips to Panorama. And what's awesome about this restaurant is that it's aimed at the après ski experience, so you can come straight from the slopes in your ski gear without having to get changed or dressed up! This is good news because Panorama offers night skiing off the Mile 1 Express Quad, and also has tubing on Friday and Saturday nights. Take the kids for a few runs down the tubing hill, and then go straight for dinner. Or, grab a quick bite and then return to the hill for a few final runs before bed. For breakfast on Sunday, we tried out the Picnic Cafe, and let me just say - I'm a huge fan of this place!! They have great breakfast wraps, local Kicking Horse coffee, fresh baking, and then a large assortment of breakfast menu items to order. I liked Picnic so much, I returned later for coffee and felt like I could spend hours here curled up with a book by the fireplace. It was very refreshing to find a ski hill offering more than the crowded "day lodge experience." Isn't this a cozy spot to enjoy a cup of coffee while taking a break at the ski hill? And find more information on Nordic Skiing at Panorama (along with trail maps and rentals) on their website. Take an improvement session or register the kids in a ski lesson for a day. All information on the Panorama Ski and Ride School can be found on their website. Starting off our days with a fast cruisy "rollercoaster ride"
Watching my son Noah getting "sendy" in the terrain park. I actually screamed watching one of his jumps, that he managed to actually land! It's always exciting too when you make it to the top of the mountain, and every run off the sign post indicates you are in "advanced terrain" - and you know you can actually go for it with your family. Have you skied at Panorama before? If so, there have been a few improvements and changes for this season. Monsterous new terrain in the Taynton Bowl with four new black lines, 128 acres of nasty "brutish" terrain, and a total of 4264 feet of vertical now - placing Panorama in the top 3 resorts in Canada. The longest run is now 6.5 km long! New 8-week All Mountain Program (AMP) for kids that takes lessons and ski clubs to a whole new level! Lunch and après ski service at the Cliffhanger Restaurant at the Greywolf Golf course - fabulous news for Nordic skiers because the trail to the Hail Hut starts from the golf course, and there's a large parking lot here! New Après Kids program from 3:30-5 daily. Activities could include tubing, ice skating on the village rink, heading back up for a few more ski runs, or snowshoeing. The program includes hot chocolate and snacks, and has a cost associated with it. Special thanks to Panorama Mountain Resort for sponsoring our adventure for the weekend, Note that all opinions are my own and I was not paid to provide a favorable review.